Square Enix’s Adventures of Mana, the latest remake of Final Fantasy Adventure, just made its way to the Android market retailing at $14. v 1.0.7 update is the 6th release which features some bug fixes! The game was originally released back in 1991 and follows the story of a young hero and a heroine as they attempt to stop the Dark Lord of Glaive from destroying the Tree of Mana. - Move and battle as you want with the new improved battle system. - Control the game using a virtual joystick with the help of the much-needed auto-adjust option. - Choose your weapons wisely as you embark on different quests. - 8 powerful magic spells to take advantage of to restore lost HP and deal deadly blows. 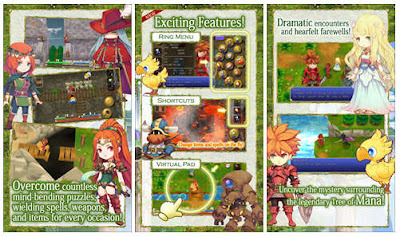 - The world of Mana is a wild place and you need puzzle solving skills as much as combat skills to overcome challenges and complete quests. Install Apk file you want, Extract and move Data folder into SDCard/Android/Obb/ and play offline. License is properly patched, enjoy! Please fix the link for the DATA file. fixed and added modded version! The regular download has to be the modded version... All items in shops are priced at -10000000. I'll try the modded link and see if you had them swapped. Otherwise the download should be listed as the modded version. thak u , i must have gotten confused!! i just swapped the links without renaming! !